Come Enjoy Lobster at The Living Room! / News / Come Enjoy Lobster at The Living Room! 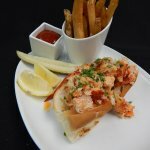 Our chilled lobster roll comes stuffed with fresh lobster, homemade aioli, and celery on a traditional roll. It comes with a side of our freshly made, crispy fries to enjoy with your sandwich! Are you looking for a warm sandwich? We’ve got you covered! 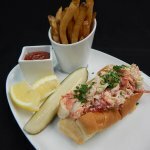 Our hot lobster roll is filled with fresh lobster and lemon tarragon butter on a traditional roll. Like all of our sandwiches, it comes with a serving of our French fries to complement the rest of your meal. 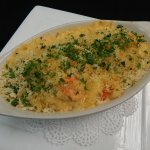 For a delectable treat, try our Lobster Mac & Cheese! Made with fresh lobster, four cheese sauce, and white truffle essence, this pasta dish has a gluten-free option available! Is there a better way to relax than enjoying a lobster roll on a patio overlooking Boston Harbor at sunset? Conveniently accessible to the Orange, Green and Blue lines on the MBTA, The Living Room is located one block from Faneuil Hall. Our dog-friendly patio is open for the summer, and we even have a special canine menu for your best friend to enjoy. For reservations, call The Living Room at 617-723-5101.